If you are well-acquainted with the famous German NBA Star Dirk Nowitzki, then you’d certainly want to know more about his wife Jessica Olsson. Although she is married to a superstar, Jessica never enjoys the glamour of the limelight. While Dirk is making the rounds on the big screens, Olsson, on the other hand, enjoys keeping a low profile. She came into the limelight following her marriage to the NBA star and they currently have three children. Read on, as we dig in on Jessica’s family life, age, parents, husband, and kids. The amazing wife of the NBA Star was born in Gavel, Sweden. She is the first child of her parents and was raised along with her two younger siblings. Olsson hasn’t disclosed her age to the media yet, she is of Kenyan-Swedish ethnic origin and holds Swedish nationality. Right from her young age, Jessica has always kept her personal details under the shades. While little is known about her early life and educational history, we can tell that she previously worked in an Art Gallery located in Dallas before she got married to the German-born NBA Star in 2012. Olsson comes from a loving and caring family; she was born to a Swedish father and a Kenyan mother. However, she has not disclosed any details about her parents, their names and their current location to the media. Her younger siblings are twins named Marcus Jonas and Martin Tony Olsson. Martin and Marcus are professional football players and they were born on May 17, 1988. Marcus is a left back player for the Swedish national team as well as the English side Derby County. His brother Martin is a left back player for the Swedish national team and Swansea City football club in England. The twins have represented their home country Sweden at the Under 19 and Under 21 World Football Tournaments. During the 2018 FIFA World Cup held in Russia, Martin was part of the Swedish 23-man squad that represented their country at the tournament. Jessica Olsson is a very beautiful and attractive lady. 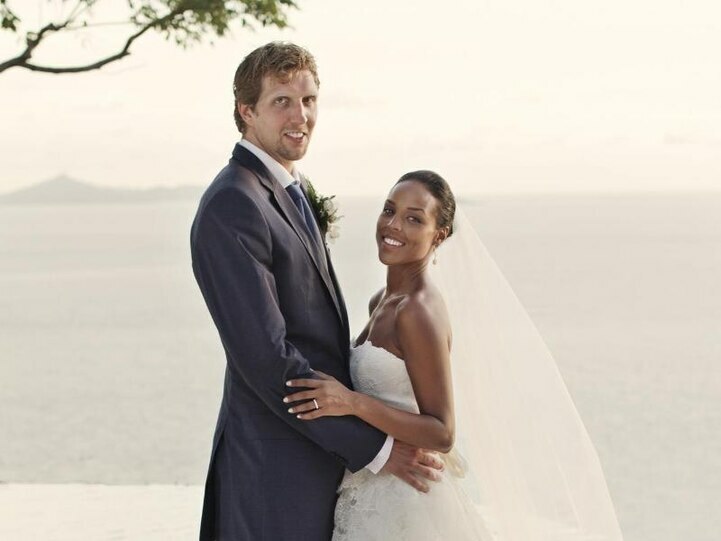 She is happily married to the basketball prodigy, Dirk Nowitzki. The couple met in 2010 during a charity event – Sports for Education and Economic Development (SEED) – after which they kicked off their relationship. After two years of successful relationship, the two lovebirds got hitched in a lavish wedding held on July 20, 2012. The wedding was held both in Germany and Kenya. Together they have three kids – a girl named Malaika Nowitzki, born in July 2013, and two boys – Max, born on March 24, 2015, and Morris, born on November 11, 2016. Dirk Nowitzki is a professional basketball player with the Dallas Mavericks of the NBA. Drafted by Milwaukee Bucks as the 9th overall pick in the National Basketball Association draft of 1998, he was traded immediately to the Dallas Mavericks where he has been playing as the team’s power forward. Dirk is a one-time NBA champion, a 13-time NBA All-Star, a one-time NBA Finals MVP, and NBA Most Valuable Player of 2007. He is one of the greatest power forward of all time; he is the first NBA player to record at least 31,000 points, 3,000 assists, 10,000 rebounds, 1,000 three-pointers, and 1,000 steals. Along with the German national basketball team, Nowitzki is a one-time bronze medalist at the 2002 FIBA Championship and a silver medalist at the EuroBasket in 2005. He finished both competitions emerging as the highest scorer and MVP of the tournaments. Dirk was named the Euroscar European Basketball Player of the Year by the Gazzetta Dello Sport for five years as well as Mister Europa European Player of the Year by Italian Sports magazine called Superbasket. Additionally, he has won FIBA Europe Men’s Basketball Player of the Year Award twice in 2005 and 2011. He became the first basketball player to be named German Sports Personality of the Year in 2011. Dirk also became the first non-American to receive the Naismith Legacy Award in 2012. Although Jessica Olsson is married to a superstar, she still keeps a low profile and doesn’t have social media accounts. Olsson and Dirk have been enjoying a wonderful married life and there’s no sign of break up yet. Wondering how tall she is? Well, Jessica Olsson is of average height which cannot be compared to that of her husband who stands at 7 feet (2.13 m). She has black hair and brown eyes with impeccable body measurements. Her height and weight cannot be ascertained at the moment.